I took these pictures of Aaron tonight while we were having dinner just so I could do a page like this! 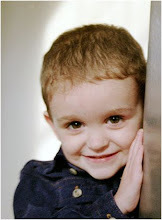 We had spaghetti, which he is not a fan of, so I got some happy pictures and a few mad pictures! I cut all of the pictures down to 3.5 inches square. All of the paper, patterned and solid, is American Crafts that I bought last summer at CKU. The letters are Making Memories Heidi rub-ons in small and large. I love this page! It may go in a frame for a little while before it goes in his album. I just love all of his different, perfect little faces-even the mad ones! This is one of my favorite pictures EVER, so I didn't want to put much on the page that would distract from the picture. We went to my grandparents for a cookout on Memorial Day, and this is Aaron and my Granddaddy grilling together! (I wish you could see more of Aaron's grill-it is so cute! Has all kinds of foods and utensils, plus it lights up and makes noise like a real grill! One of my favorite yard sale finds so far this year!) 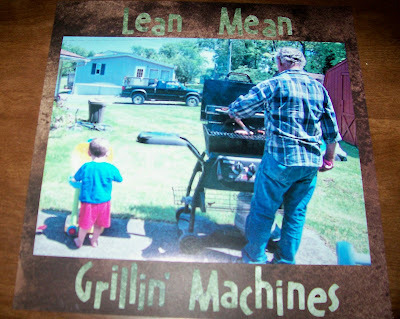 Anyway, the papers are both Bo Bunny, and I cut "Lean Mean Grillin' Machines" with my new Opposites Attract Cricut cart! Here is a page that's been setting at my table half-done for a month or two. It needed something but I could never figure out what! I think the paper is American Crafts, but I'm not sure. The ribbon is something I bought and never used for Aaron, and I pop-dotted Alex's name on top of it. The letters are All my Memories rub-ons. I added a "Little Boy Blue" Jolees tee at the top. Now I finally have 1 page done in Alex's album! Can't wait to add more! I really need to take some pregnant pictures, which is something I failed to do with Aaron. I better get to it because Alex will be here before I know it! Well, that's all for now. Its about 9pm which means its way past my bed time! Hope you're all having a great weekend! It stormed here today so we stayed indoors all day, but tomorrow my in-laws are opening their pool and having a cookout, so I'm hoping to break out of the house to go visit and get some pics of Aaron in the pool! Thanks for stopping by! So, you terrorize your sweetheart with spaghetti! I love the page . . . lots of expressions! I LOVE, LOVE, LOVE the grilling page! How cute is that? What an awesome photograph! The Alex page is wonderful too. Don't forget to take some pregnant photos! Have a great weekend! Oh Becky! These are all so fantastic! I love the many faces of Aaron! He is just too cute! The second page is adorable, too! 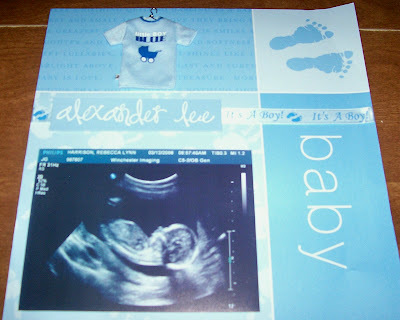 The baby Alex page is fantastic! So glad you are getting rest! Take care of yourself! Great pages, Becky. I especially love the "grilling machines"
hahaha cute cute page of Aaron. And I see you are already starting a book for your next little one. I should follow your example. :) Hope you're surviving well! 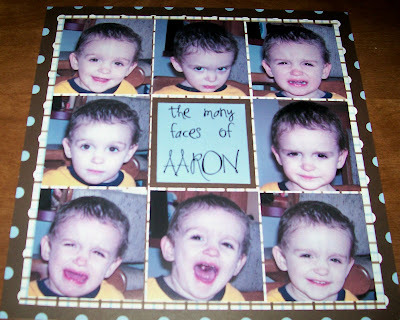 Becky - Hi this is Shannon (SHeaRI) from Simple Scrapbookers on CafeMom - figured I would come check out your blog - I love the Many Faces of Aaron - I have a similar page on my blog of my son Jack... I'm going to keep checking out your blog - great work!